When I became a Toronto wedding photographer I had no idea how intense the emotions are on the wedding day. 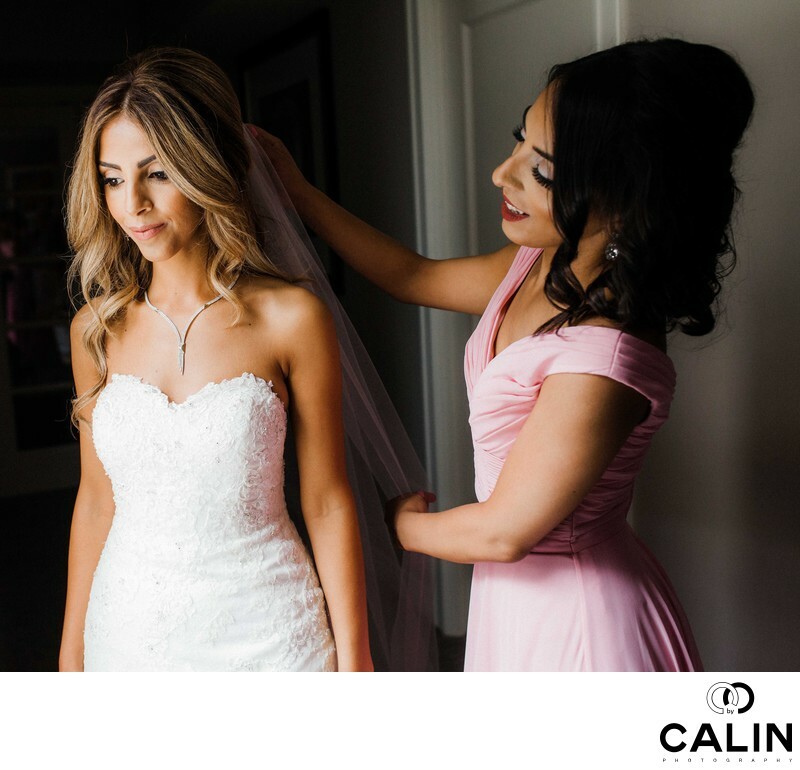 The bride experiences emotions ranging from extreme happiness to almost sadness when something goes wrong on her big day. Recently, I photographed a wedding where makeup and hair were terribly late and you can see that the bride is worried that she might be late for her wedding ceremony. The truth is, if something derails the timeline, that has a negative influence on the bride and groom's mood. Their big day will not go according to the plan and that can be a fun spoiler. In this image, you can see our beautiful bride standing by one of the elegant arched windows at Liberty Grand. On her right, we can see the maid of honour helping the bride put on her veil. The bride looking outside the window, probably thinking about the rest of her big day. This photograph is probably one of the most emotional in the wedding album and it is a privilege for us, professional photographers to capture such moments for the bride and groom. These images immortalize fleeting moments but will be church forever by the newly born family and their children. I was chatting with another wedding photography professional and he told me an emotional story about a grandmother who showed her wedding album to her granddaughter. They were flipping through the photographs of the grandmother's special day depicting an events that took place in Toronto in 1975. The granddaughter, with only five years old looked at the pictures and recognized the bride in the photos being her grandmother. Surprise she asked: what happened grandma? Sadly, the passage of time left marks on the brides beautiful face and she became an old lady. The only thing left from that perfect wedding was this wedding album. It is stories like this that make us, realize how important wedding photography is for current and future generations. The truth is that wedding photography she's our reality and no matter how beautiful this special day was, the couple will always remember it through the eyes or other the lens of their wedding photographer. Therefore, your pictures are way more important than the venue, the flowers, the cake, the makeup and hair. All the above are gone and the end of your big day. What is left is the love between you and your husband and your wedding images. There are plenty of gorgeous venues in the Greater Toronto Area but only a few of them boasts such beautiful backdrops like Liberty Grand. However, the most important element for me are the magnificent arched windows that create a splendid soft light. Here the bride and her bridesmaid are lit by a soft beautiful light that makes the skin glow. While I love flash and strobe photographs, I prefer natural light especially on a busy wedding day when I might not have the time to setup several lights. To capture this photograph I used a prime lens, namely the Fuji 23 mm mounted on the XT2 camera. In order to keep both subject and focus I used a deeper depth of field so I shot at f4. One of the most common mistakes as he photographers make it to photograph to subjects at very shallow depth of field. Often they do that during the bride and groom photo shoot. If for example the couple are good distance apart, photographing them at F1.2 is a recipe for disaster. I know because I did that when I started my career as a photographer. Generally, the person out of focus is unrecognizable and looks like a big blob. The solution? When photographing the bride and groom portrait, shoot it at least at F3.5 so that you have both subject in focus.